Fake Food Watch: McDonald's McRib: Delayed Because of Pink Slime-Like Fears? 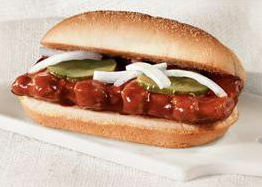 McDonald's McRib: Delayed Because of Pink Slime-Like Fears? McDonald's McRib was slated to temporarily reappear (again) in late October 2012. The question occurs to me... in this year of heightened food-awareness and pink-slime outrage, could McDonald's fear the public taking fresh appraisal of their ribless McRib? Of asking, "What exactly IS this heavily slathered, pork-like 'patty" on a fluffy white bun?" 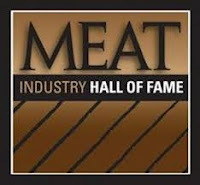 "Restructured meat products are commonly manufactured by using lower-valued meat trimmings reduced in size by comminution (flaking, chunking, grinding, chopping or slicing). The comminuted meat mixture is mixed with salt and water to extract salt-soluble proteins. These extracted proteins are critical to produce a “glue” which binds muscle pieces together. These muscle pieces may then be reformed to produce a “meat log” of specific form or shape." Professor Mandigo boasted to NPR last year that he was tasked, in the 1970s, by the National Pork Producers Council to "create a product with pork trimmings that could be sold to the fast food giant. 'The pork producers wanted to see more pork on the menu, and they were targeting McDonald's,' Mandigo said." Frank Perdue, founder of Perdue Farms, which produces "more than 50 million pounds of poultry a week"
Raymond Townsend, whose engineering firm "became the largest designer and manufacturer of skinning, stuffing and injection machinery for meat, poultry and seafood processors worldwide." McDonald's lists as ingredients for the McRib Pork Patty: "Pork, water, salt, dextrose, preservatives (BHA, propyl gallate, citric acid)"... which doesn't begin to define what is meant by "pork." Don't get me wrong: I plan to sample a McDonald's McRib next time they appear on the drive-thru menu. I want to know what all the fuss is about. But I do wonder... wouldn't it be healthier, safer, tastier, and cheaper-by-the-pound to just buy pork ribs at the market, and grill or roast them at home? Those ribs will have bones, at least. I've often wondered what that thing was when I saw the TV ads. I imagined biting into a bun containing small rack of real ribs and thought that probably wasn't what was going on :-) Pink pork slime. In a red sugar-sauce. Mmmm. Thanks for the blog comment. Did you see our blog got named one of the Top 50 blogs for Authors this morning? Great to meet you at the conference! We Completely Remove and Reverse the Magic, Evil Spells and Curses. Authentic Healing & Curing for all your Spiritual & Medical Diseases.